Protect your feet well - they're all you've got to stand on! 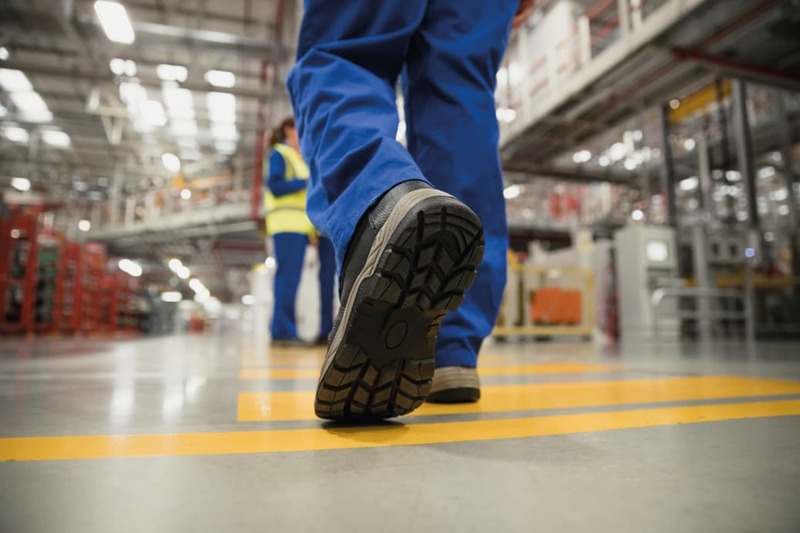 In workplaces today, protective footwear is designed to protect workers from physical hazards that they could come into contact with as a result of the job. These include hazards from wet or hot slippery surfaces, stepping on sharp objects, falling objects and exposure to corrosive chemicals. To lots of workers, footwear is not the most desirable aspect of their job, but, desirable or not, foot-related injuries remain widespread and costly, and employers attention to a safety footwear programme could offer a substantial return in improved safety and productivity. There are certainly sufficient financial incentives for industry to pay close attention to foot-related hazards. 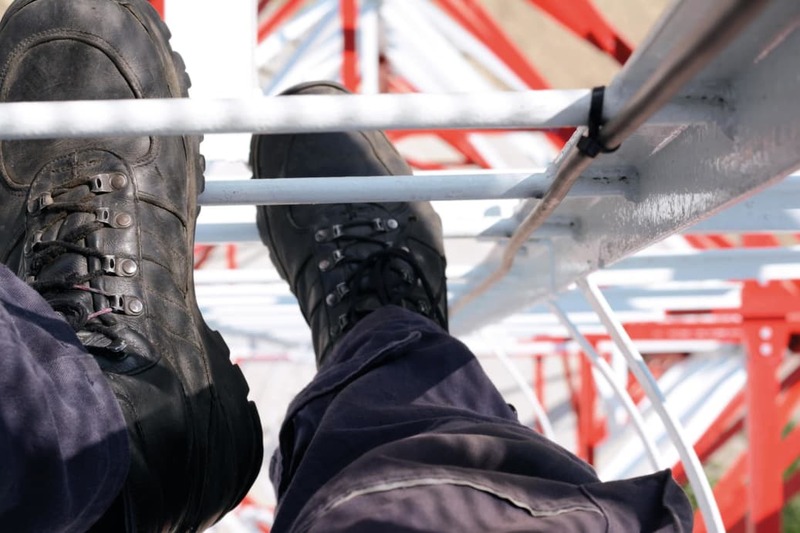 According to the National Safety Council, workers suffered 180,000 disabling injuries to the feet and toes in 1995 alone, therefore the importance of safety footwear is not to be over-emphasised. In accordance with OSHA's foot protection standard, 1910.136(a), workers must use protective footwear where they could be working in zones with the possibility of danger to feet as a result of either falling of objects or undulating surfaces, or objects piercing the sole, and where employees' feet could be exposed to electrical hazards. Impact and compression resistance - This uses either steel or a non-metallic toe cap (steel toe) to protect against any falling objects or crushing from heavy undulating objects. Metatarsal footwear – This provides similar protection against falling objects to the area of the foot between the ankle and the toes. Electrical hazard – The sole of the boot is designed to protect workers from electric shock from 600 volts or less, under dry conditions. Conductive footwear – The footwear is built to prevent build-up of static electricity. Puncture resistance – Here the sole resists penetration from sharp objects, such as nails or broken glass that could pierce into the soles of the boot. Static-dissipative – This reduces the footwear's build-up of static electricity through conducting body charge to the ground, while protecting workers from electrical hazards. As a worker, protecting your feet is very important, and you should know the risks in your workplace. When selecting footwear, always consider the safety hazards in your work area. The safety footwear standard has been designed to protect employees from foot related injuries during the course of their work. Affected employees will wear foot protection that meets the ANSI standard. The selection of personal protective equipment will be based on a hazard evaluation of the area and the type of job, standard operating procedures, and materials of the task being conducted. Foot injuries, however, are some of the most prevalent accidents encountered in the workplace. Some injuries occur as a result of the employee not wearing appropriate protection. Others happen because the wrong footwear is used for a particular job; thus, giving the employee a false sense of protection. Due to these facts, before footwear is selected one should review the type and style used for protection, the procedures being performed and the materials involved. Any selected protected footwear shall be in compliance with ANSI Z41-1991- American National Standards Institute standard. All safety footwear would have to meet minimum safety standards described by the International Organization for Standardization (ISO). 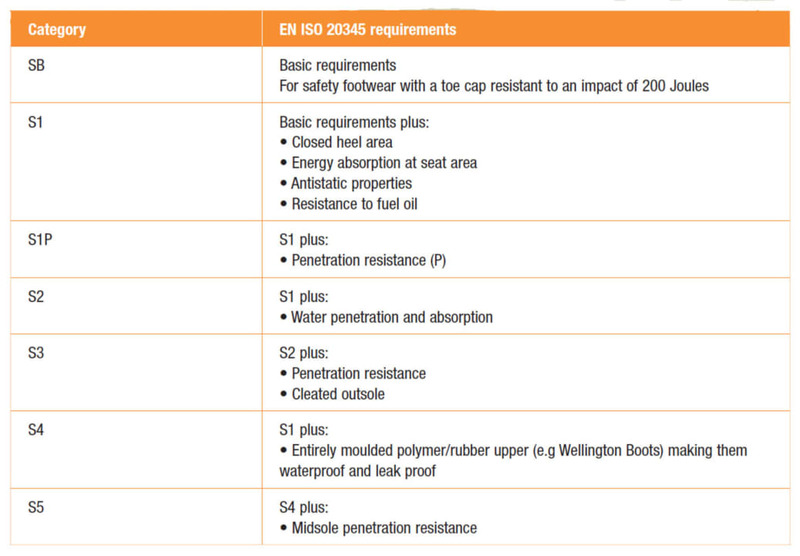 Europe’s EN ISO 20345:201 is the current standard for safety footwear across the world. This was last updated in 2011 to make it stricter. According to the standard, all safety footwear should now have toe protection of about 200 joule impact, as this is the amount of energy the toe area can absorb prior to breaking. All safety footwear products must be certified to EN ISO 20345:2011 standard to be valid. Every employer must practice a foot protection programme that is appropriately implemented. This programme must include selection, training, maintenance, inspections, fit testing, and training. Footwear related injuries are mostly caused by inflammation of a thick band of tissue, this is usually the plantar fascia that connects the heel bone to toes. Also possible is a common injury called tendinitis, that usually occurs when footwear has an incorrect amount of arch, in accordance with the American Orthopaedic Foot and Ankle Society. A case of an incident in my workplace further revealed the nature of an incident that could occur if you do not protect the feet properly. A worker slipped and fell while rushing to board the chopper. The slippery surface did not hold the 46 grip from the bottom of the footwear he was wearing. He sustained injury that could have been avoided. Statistics have shown that in the world, among the working population about 50% of footwear injuries occur at workplace. Injuries at work result in greater costs because they involve more serious injuries, and because workers that require manual skills would need a higher level of rehabilitation to return to work. 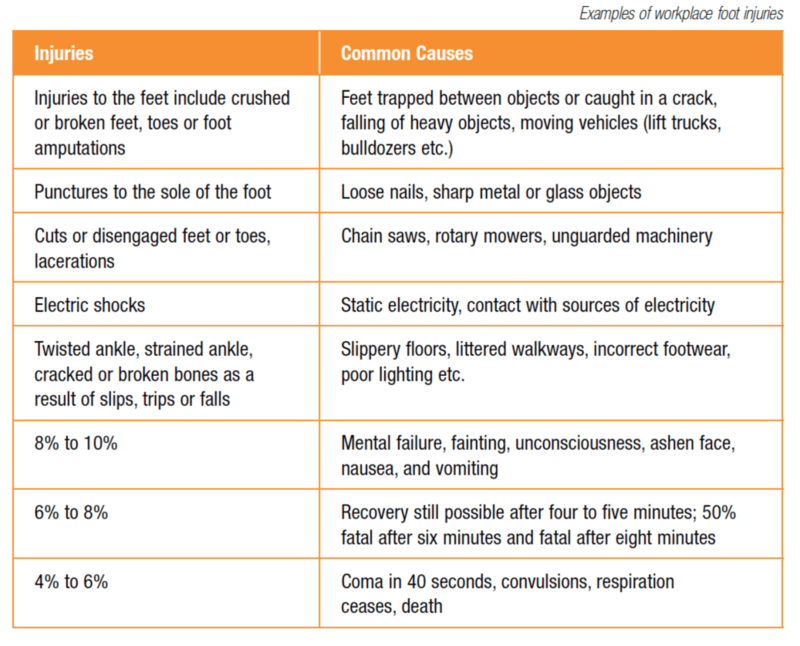 Unless the labour costs are taken into perspective, the impact of footwear related injuries is greatly underestimated. Workers are required to obtain the right fit and comfortable footwear whenever they want to purchase or select new protective footwear, in order to prevent ingrown toenails, calluses or tired feet that are predominant amongst workers that spend lots of time standing or doing a lot of walking. These may be referred to as occupational injuries, but could have serious consequences on health and safety in workplaces such as fatigue, discomfort, and pain. Fatigue mostly causes workers injuries affecting the muscles and joints. Safety footwear is designed to protect the feet against numerous types of injuries. The most common types of injuries are impacts, compressions and puncture. The precautionary measures for workers would be to select footwear according to hazards in the workplace and ensure that footwear has proper sole protection suitable for the working conditions. Metatarsal protection (for the top of the foot between the toes and ankle) is used where the potential for injury is suspected. It’s advisable to always check the company guidelines on footwear prior to purchasing. Workers should ask their supervisor what type of protective footwear and other personal protective equipment is required when in doubt. The ANSI standard Z41-1999 “Personal Protection – Protective Footwear” is available for guidance. 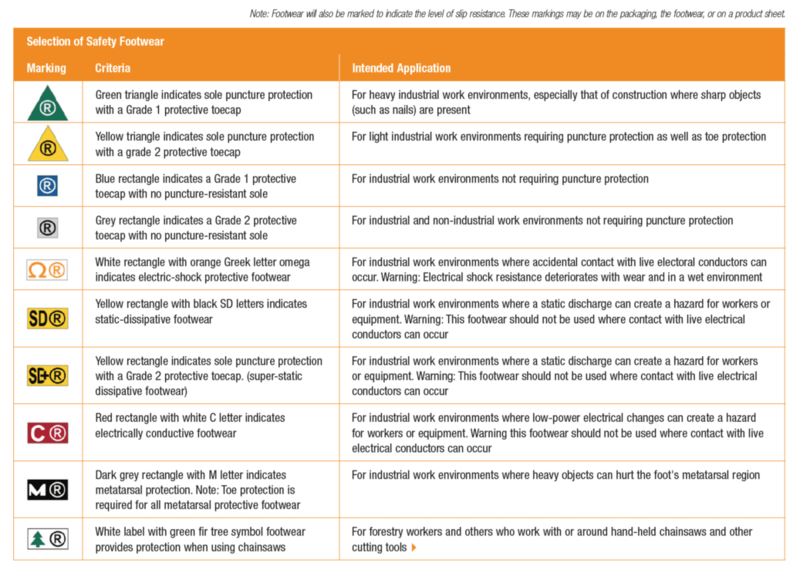 There is also the ANSI Z41 User Guide for Protective Footwear, which workers are encouraged to use. There are numerous safety measures to consider in order to select the right type of footwear needed for the job. The common types of protective toes (steel, composite and aluminium), are ASTM rated for protection. Workers would select safety toes based on hazard assessment and work types and needs. These are the old types of steel toes, they are heavy and most compact, and conduct high temperatures more than others. Today, protective toecaps are available that are designed to improve fit and comfort. This type has lightweight protection options that meet ANSI/ASTM standards, providing more options for workers because of their lightweight nature and being thinner than steel toes. These are made up of carbon fibre, plastic or Kevlar. They are lighter than steel toes and at the same time are the thickest option. They have a bulkier silhouette than steel or aluminium options. This type of toe is non-metallic and does not transfer heat or cold, making them the preferred option for workers that pass through metal detector devices or wish to be in an environment to stay metal free. Similarly, work footwear with metatarsal guards help to protect the upper foot and toe area from heavy falling objects. The five key factors that every worker should consider to select trusted footwear are as follows. Footwear with comfortable features will go a long way to protecting workers’ feet. Many foot problems start with ergonomics issues, such as weight and support, or from lack of comfort, padding and breathability. A tight toe on footwear has the potential to lead to numerous ailments including in-grown toe nails, blisters, corns or worse, as well as discomfort in the toe box from the safety toe cap. Finding the right size of footwear is very important to ensure allday comfort. Think long-lasting, rugged and durable. These are key features for shoes that will be exposed to chemicals, sharp objects and wet conditions in work environments. There is footwear for almost any hazard, offering protection against electric shock and static dissipation, as well as impact to the toes, and sharp objects into the bottom of the foot. Each of these hazard prevention areas has its own CSA symbol associated with it. Make sure the shoe you select has the appropriate safety symbol to match your needs. 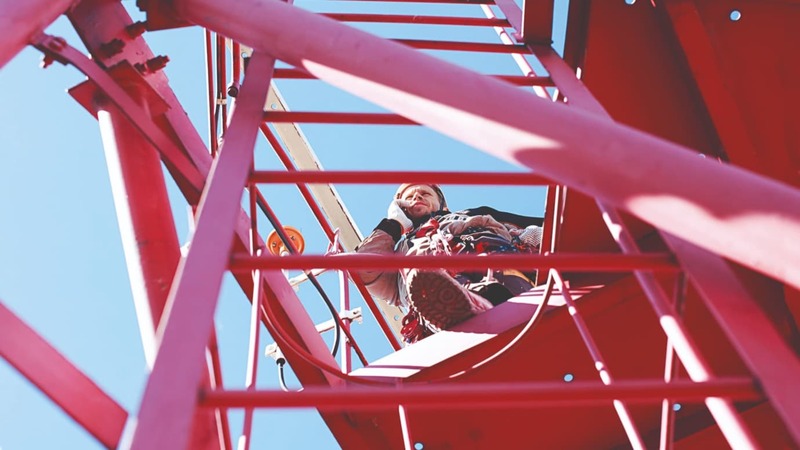 Studies show that compliance with safety regulations improves if the safety equipment looks good to the employee. Personal satisfaction goes a long way towards a proper safety attitude. Remember this: a slippery sole is a deadly sole. You must consider slip resistance during shoe selection; however, keep in mind that slip resistance of soles varies based on temperature, and content of water and lubricants, among other factors. Make sure the sole is recommended for the type of work environment you will be exposing it to. As outlined in the table below, these symbols, or markings, will help you determine which footwear is appropriate for the job. Most workplaces have various types of hazards that could result in injury. Here are some of the most frequent potential hazards that require protective footwear. Electrical hazard boots are an essential piece of PPE for anyone working around electricity. This could be an electrical worker or someone who works around circuits or high voltage machinery. This footwear is manufactured with nonconductive, electric shock-resistant soles and heels. These kinds of shoes prevent the worker from completing an electrical circuit; this can reduce the chance of electrocution. If you work around explosives or other highly reactive or flammable substances, you will likely need electrically conductive shoes. Electrically conductive footwear helps prevent the build-up of static electricity on the worker. Without this precaution, static build-up on your body could easily generate a spark that could cause a fire or explosion. Silk, wool and nylon socks should not be worn in this type of work environment. If you are at risk of falling items, you will surely want safety toe boots. These are boots that have capping over the toe area for protection. These toe caps were traditionally made of steel, hence steel-toed boots. However, as mentioned earlier, they are now also available in composite materials. Sharp objects on the floor pose a workplace hazard. Sharp objects, like nails or screws, can puncture through the soles of regular shoes and injure your foot. Puncture-resistant footwear includes a steel or composite plate positioned within the midsole to protect from the dangers of stepping on sharp and jagged objects. Some work footwear has additional protection along the metatarsal region (the top of your foot). If you have ever dropped anything on the top of your foot you’ll know how much it can hurt. Metatarsal boots are good for work environments where rolling objects or machines present a risk. Any job that involves heavy machinery, heavy loads, or dangerous conditions can require the use of metatarsal boots. Slip-resistant shoes are required for a large variety of industries. Healthcare workers, kitchen workers, table waiting staff, industrial workers, factory workers – the list is almost endless. Slip-resistant shoes come with a sole that reduces the slickness that can cause a fall or accident. 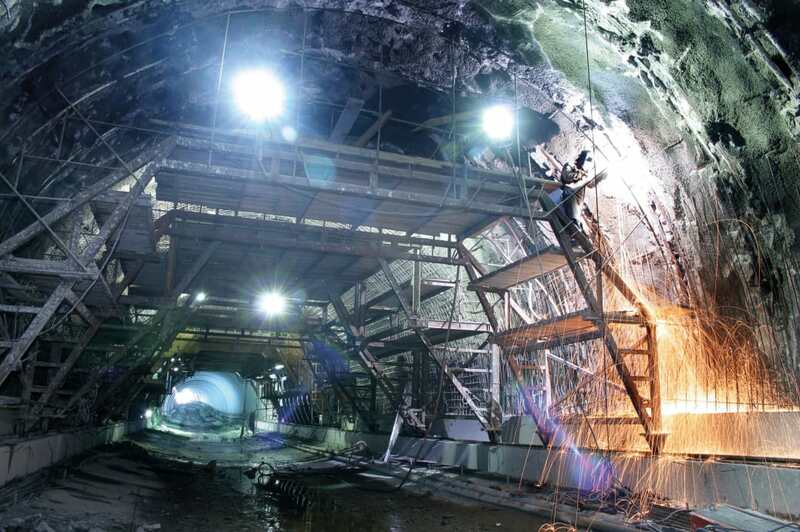 Working with molten metals presents huge risks. Foundry shoes are made specifically for these types of occupations. These are designed to insulate against the extreme heat of this kind of environment. 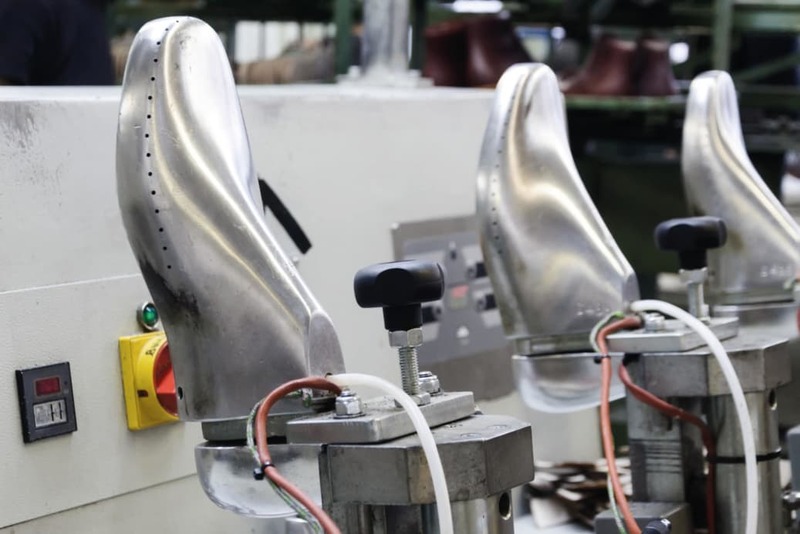 They prevent hot metals from getting lodged into shoes’ eyelets. They also frequently come with an easy slip-off design in case of burns caused by a molten metal splash. The maintenance care is necessary to ensure the optimum lifespan of the footwear. Always use a protective coating to make footwear water-resistant. Regularly inspect footwear to spot any damage such as cracks in soles, or exposed toe caps, and immediately repair or replace defective footwear. Any footwear that is exposed to impact may not have noticeable signs of damage. Replacing footwear after an event is advisable. The table below details safety ratings for foot and leg protection. The feet are engaged in almost all activities in a job and they account for a large number of all occupational injuries in workplaces. It is very important, therefore, to protect them. Safety footwear enables tasks to be executed safely and prevent injuries to the feet. Therefore, by selecting the right footwear, with the right protection level and monitoring, there will be less downtime and lower worker absence, ultimately giving rise to injury free workplaces. Footwear must be regularly inspected and replaced in case of wear and tear. A very important precaution to always take is to wear approved safety footwear. It is necessary to check the appropriateness of the type of footwear prior to use for a task. In addition, certain precautions must still be taken to reduce the level of danger during execution of tasks involving footwear usage.